For many, if not most, people the only time they see the majority of their extended family at one time is at family reunions. Aunts, uncles, cousins, grandparents, individuals who are somehow related, even though you can’t quite remember how—everyone converges in one spot to reconnect and (hopefully) enjoy one another’s company. It is indeed a special time, and one that most like to remember. What’s the best way to celebrate such an occasion? Our personalized Koozies found here! Of course, the standard reunion remembrance items are usually photographs, napkins and custom t-shirts. However, ordering t-shirts for a large group of people can be a messy affair due to the fact that attendees often range in size from small to double extra-large or bigger. And you have to ensure that you get the right amount of each size so that everyone will fit into their shirt. On top of that, there is the problem of color: not everyone looks good in the same color and if you think someone won’t be complaining and refusing to wear your yellow (for example) family reunion shirt because it makes them “look like they have jaundice,” then you either have the most relaxed family or your expectations are way too high. 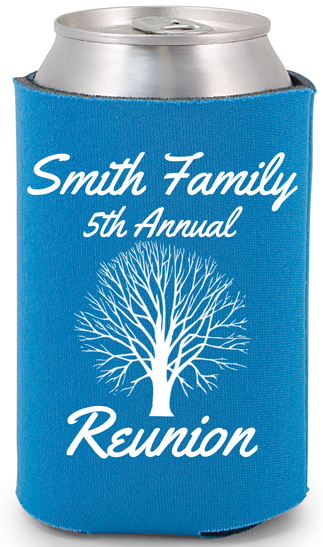 Koozies are a great way to both remember a family reunion and avoid the almost-inevitable t-shirt disaster. They are extremely functional, especially if your family reunion, like most, takes place during the summer when the kids are out of school and the weather is nice. Koozies will keep your drink cool, keep your hands off of the freezing cold can, and sharply decrease the likelihood that the condensation buildup on the outside of the can will cause someone to drop it and make a mess. (Every family has that one clumsy/clumsy when tipsy or drunk individual, right?) Personalized Koozies are also much cheaper than t-shirts and other commemorative gear, meaning that you will be able to save money or allocate money for another purpose, such as giant inflatables for the kids and kids-at-heart. They are also much easier to order and distribute because they are one-size-fits-all. Most importantly, they are incredibly customizable! Our Premium koozies come in over twenty colors and can be printed with over thirty ink colors as well. You can order them in a variety of colors, if you like and choose from a number of different decorative options. Select a color, font, graphic, and your custom message and you have easily created a unique family reunion memento that can be enjoyed for years. Because they are so low priced, you can even order them in a variety of colors so that everyone has a chance to get their favorite. Or match your colors to those of the sports team your whole family supports—the possibilities are endless! So, when you’re planning your next family reunion, remember the Koozie. Consider it as the fun, easy, functional, and less expensive alternative to other memento items and make your family reunion as cool as the drink inside the Koozie.